Champion Reaper and Mower, No.2 – Was made of wrought iron, which gave the machine good strength and kept it from being too heavy . It had two driving wheels that worked independent of each other so it could pass over uneven or rough terrain and still keep the operator(s) and cutterbar stable. The machine featured a liftable cutterbar to avoid obstructions or be put into a narrower travel position. The champion also could cut while turning either left or right so the outer parts of fields could be cut. For the animals pulling it, the reaper pulled with little draft or without pulling to the left or right and put very little weight on the horse’s neck. 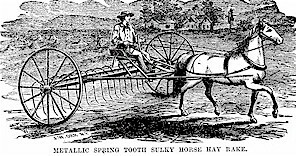 Metallic Spring Tooth Sulky Horse Hay Rake – Came in 16 or 20 tooth versions, depending on width. 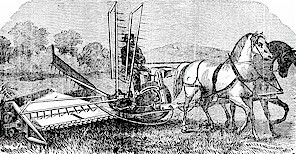 The rake had been well tested in the east and west parts of the U.S. and had good approval from farmers. The description read “I seems to be all that can be desired in a horse hay rake”. 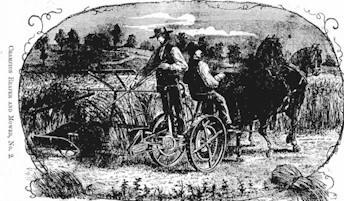 Palmer’s Excelsior Hay Stacking System – Introduced in 1865, the Palmer was a totally re-designed system from stacker systems used in pre-civil war times. 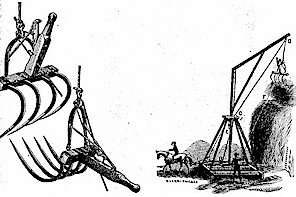 With a strong hoisting fork and frame that utilized wrought iron, it could handle as heavy a load as what the horse providing the power for the stacker could provide. It was maneuverable enough to stack hay in lofts and also had the ability to make large outdoor stacks. Climax Hay Reaper – The “senior” version that featured a 4 1/2’ cutterbar and had many features that made for a reliable machine. The enclosed gear box that ran the cutting system kept dirt, grass and moisture out and featured steel shafts that provided longer life. The floating cutterbar was made of spring steel that allowed the bar to follow the ground’s contour. The cutting knives themselves were made of a softer steel that wouldn’t wear out due to the constant motion and friction the system had to handle. 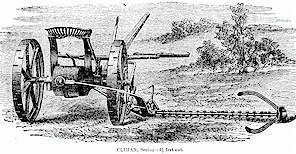 The climax also featured 2 speed gearing for the cutterbar drive so heavier crops could be cut or so one could work at faster speeds in favorable field conditions. Kirby Self – Raker – Gave farmers high productivity at the price of $185 per new machine and was the lightest draft self raking machine of its time that worked well in both mowing and raking. In field tests 2 mules often pulled the machine to show farmers just how effortless the machine worked.